Successful HR transformation isn’t just about giving your line managers more power. It’s about helping them use it more confidently and consistently. Almost every business is somewhere on a journey towards HR transformation, whether it’s in the embryonic first stages or there’s a strategy that’s already in motion. But the most important factor in this process isn’t the HR department as we’ve known it. It’s the line managers. Line managers have long since been instrumental when it comes to delivering employee experience, across any business. And for HR transformation to really succeed, they need to become the new frontline of HR. But you can’t just hand them the responsibility and employee relations training and hope that’s enough. To give more to your employees, they need more themselves. Our new ebook, HR Transformation: Why Line Manager Capability is Not Enough, reveals how some organisations are achieving more successful transformation, by helping their line managers develop consistency and – most importantly – confidence in the role. As the new frontline, your line managers will handle everyday employee relations difficulties. Transformation turns issue resolution into a faster, more informal process – and fosters more open, positive relationships between managers and their teams. All that, without ever having to escalate an issue to the HR department, who can, in turn, focus on the more complex tasks and big, strategic business goals. In reality, even if you give line managers the most comprehensive training and resources in the world, it might not be enough for them to be the effective frontline HR (or the rest of the business) needs. 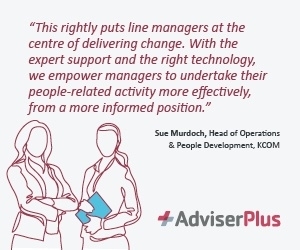 Your line managers must have the confidence to put your policies and procedures into practice – without having to put a call in to the HR department. A call most HR professionals, however busy they are, will still take. When you work in HR, it’s difficult to let go of these everyday processes. If a line manager comes to their HR team with an issue, they’ll naturally want to help. And not just for altruistic reasons. Solving individual, tangible problems delivers the kind of instant rewards that a daily striving towards big, overarching business goals doesn’t. You get respect, connection, satisfaction – the very things that draw HR professionals into such people-focused roles. It’s therefore crucial that HR teams feel the impact of the high-level work they’re doing. If not, their instinct to help can derail even the most carefully considered HR transformation. They might be looking elsewhere for answers (like the internet) and finding inaccurate advice, or – little better – advice that doesn’t match your company’s policies and procedures. They might be going ahead and applying your polices, but applying them incorrectly. Or, most likely of all, they might be ignoring the problem altogether. Every one of these responses leave your organisation open to greater risk of employee grievance cases, and even tribunals. For HR transformation to succeed, your line managers need simple, accurate information, clear direction – and easy access to expert support.